The Mariamman Hindu Temple is a little known Hindu temple in Ho Chi Minh City. Most Vietnamese are either Buddhist or Catholic, but this is a little piece of Southern India in the midst of the number one economic center of Viet Nam. There are only 100 Hindus in HCMC, all of them Tamils. This temple, known in Vietnamese as Chua Ba Mariamman, is considered sacred by many ethnic Vietnamese and ethnic Chinese. Indeed, it is reputed to have the miraculous power to bring luck or wealth to people. The temple was built and the end of the 19th century and is dedicated to the Hindu goddess Mariamman. At that time, business between Viet Nam and China, India and other countries in Asia developed vigorously. Merchants from India and even the Middle East came to Viet Nam frequently. The Mariamman Temple must have been constructed by the Indian settlers at that time. This tourist destination is only three blocks from Ben Thanh market. It is located at 45 Truong Dinh Street in District 1. It is open from 7 am to 7 pm every day. A notice to travelers: Take off your shoes before stepping on to the platform. The lion to the left of the entrance used to be carried around the city in a street procession every autumn. 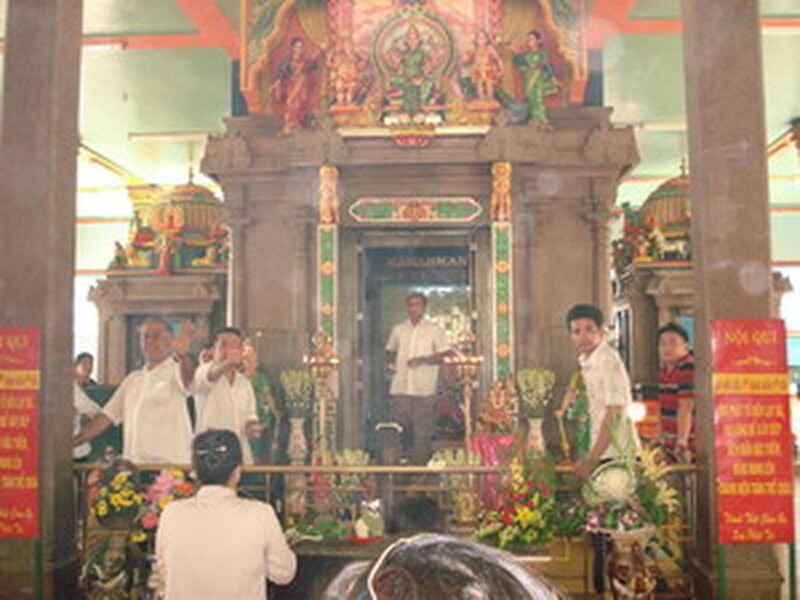 In the shrine in the middle of the temple is Mariamman flanked by her guardians: Maduraiveeran (to her left) and Pechiamman (to her right). In front of the figure of Mariamman are two lingams. Offerings placed nearby include joss sticks, jasmine flowers, lilies, and gladiolus. The wooden stairs, on the left as you enter the building, lead to the roof. There you’ll find two colorful towers covered with innumerable figures of lions, goddesses, and guardians. After reunification, part of the temple was confiscated and used as a factory for the production unit of joss sticks and the processing sea food. Since doi moi, the whole temple has been returned to the Hindu community.